To start up with your trek adventure below are some of the forts ideal for a day picnic and to hike and climb its mountain rocks. And why just trek, There are many other monsoon hangout places around Mumbai. But if you are particularly here at Marine lines and Nariman point for those High tides, Keep note of this tides dates which i update every year. People trek to various locations from Mumbai, Some near and some far up to Raigad, Goa and Kolhapur within Maharashtra Circle. Some expert trekker groups like ‘Sahyadri Mitra’ shares their experience and alerts all monsoon trekkers to be aware of some of the risky trekking locations to ignore as it is very dangerous, Not for occasional trekkers. Below are 15 to 17 such locations to be noted and should not be in your trekking locations list near Mumbai. Bhira Village at Raigad has Devkund Waterfall. Mumbai’s Far North, Thane district has Vasai’s Famous Chinchoti Waterfall. Navi Mumbai’s known Pandavkada waterfalls at Kharghar. East Mumbai’s Badlapur has one famous Kundeshwar river and waterfall. Prabalgad’s Kalavantin Fort located at Mumbai’s Panvel Location. Asangaon’s Mahuli stream near fort. Nalichi Vaat at Harishchandragad near Malshej Ghat before Moroshi Naka. Kataldhar Waterfall at famous Lonavala hills. More locations to explore with expert or well experienced hikers.. Located at Khireshwar village at the very famous trekking location called Malsejghat, Harishchandra fort will take complete 2 days. Your trek will start at the village to the famous spot called ‘Kokan Kada’ which is about 3500 feet, a great and breath taking trekking experience. The overnight resting can be done at Taramati which is near fort where food and other facilities is available. How to reach : Nearest station from Mumbai is Kalyan and from there you need to take bus to Khubi Junction at Khireshwar village to start up with. Comparatively a short trekking spot located in raigad district, Karnala fort is 125 feet high and is known for Pandu’s Tower Pillar and Karnala Bird Sanctuary as a special attraction between trekkers. The trek take about 3 hours (one day trek) with no food facilities around, So you need to carry all necessary eateries, water before starting you rock climbing and hiking activities. How to reach : Karnala fort is about 10 kms from Panvel station, Get by your car of catch a local train to reach Panvel and rent a auto / taxi whatever is easy available on the spot. Pune, A near destination city of Mumbai has this Torna fort at Velha village on the way on Katraj Road. A recommended rainy season trekking location targets climbing to the top point destination and the main entrance called ‘Bini Darwaaja’. It is a day only trekking destination and accommodation is only available at MTDC hotel or inside Menghai temple near fort. A classic view from fort is what attracts the trekkers to go day long and reach there. Since food and water facilities not there, you should carry your stuff before starting this trek. How to reach : From Mumbai, take a bus or train to pune and reach Velha village, Once there get a private vehicle which will drop you till MTDC or Menghai Devi temple. Again a short and one day trekking location and an ideal spot in monsoon season, Gorakhgad is a rough hilly mountain located at Dehri which is near to Murbad at some distance from Kalyan. This trek has a temple at a top and a shallow deep view, a breath taking experience for you trekkers. It is one of the famous and short Monsoon trekking locations near Mumbai. How to reach : First reach Kalyan catching local train or in your private vehicle. Next from kalyan you need to reach Murbad and need to catch another bus that will take your to Dehri Gorakhgad fort. Located in Pune near Mumbai, Purandhar fort is a historic trekking location built during Mughals time. The specialty of this fort being a statue of ‘Murarbaji Deshpande’ who fought with Mughals to save the fort and gave his life for same. Purandhar location is famous for one more thing, The National Cardet Corps Academy apart from other famous attractions that attracts paragliding lovers. 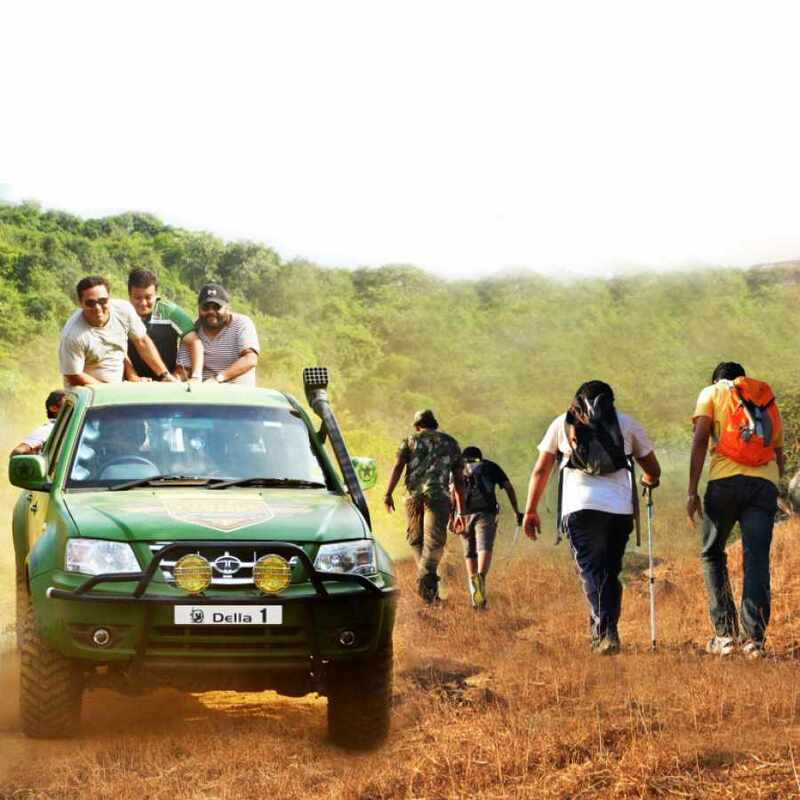 The trek is quite near to a location in Pune called Narayangaon and its take about 2 hours to complete the trek. There is no stay option available, so hikers need to take their food and belonging before starting to climb this rocks. Its a ideal day time trekking location only during monsoon. Very near to a famous picnic spot called Lonavala, Nearest station to reach Lohagad trek is Malavli at 9 kms distance. Speciality being that during monsoon when the trekkers reach on top, they may experience a whole new world with clouds touching you and making you wet. Bhaja caves and Pawda dam are two other surrounding attraction spots near lohagad. 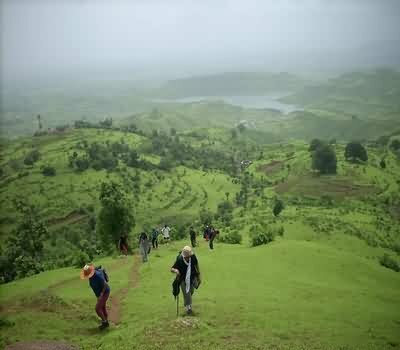 Monsoon trekking experience is worth id you find little rain and once you reach the top, Don’t forget to click some pics of that nice panoramic view of Pawna dam. Trekkers are advised to carry food and snacks are no facilities are available here. How to reach : Rent a car or in private vehicle and catch pune express highway towards lonavala, Malavli is just next station and from their at about 9 to 10 kms is Lohagad mountain. Alternately you can also catch trains heading towards lonavala and get down at Malavli. Yet another short trekking location near Mumbai, Peb fort takes about 2 to 4 hours only with lots of turns and twists and is recommended to go with some already experienced person. At about 3 to 4 kilometres from Neral station, Vikatad has some ancient Lord Datta Mandir and the overall fort location is known for it nice ambiance between trekkers. The peaceful and scenic monsoon attracts many hikers for a day long trek. One you reach on top, you will experience this locations as a central scenic place to view Malanggad in Kalyan, Chanderi Fort at Neral and Prabalgad at Panvel and the most famous Matheran Hills too which are all quite near to Mumbai within city limits. How to reach : Reach Neral station in central with you private vehicle or local train and from their another 4 kms start your trek. An excellent overnight trekking location which takes about 2 complete days trek this fort, you can see Raigad ropeway and experience the feeling like those maratha kings in this location. You can rest at MTDC hotels or another alternative free accommodation at ‘Dharmashala’ with food and other facilities. How to reach : Catch the Mumbai Goa highway and reach Mahad town in Ratnagiri district, From Mahat it is about 20 kms to reach the fort. A Peth Fort at karjat, with water, food and accommodation facilities available, Kotholigad is a ideal trekking location for those who are looking for a short trek experience at low heights. With temple and caves at basement that connects the tunnel till top of this fort it is another non isolated trekking destination nearest to Mumbai. How to reach : On central route near Karasa is Karjat station, take your private vehicle from Mumbai and reach in few hours. Rajmachi is connected to Karjat’s Kondivade Village and Lonavala, while lonavala route is longer, Village route is tougher. The trek experience gives warm feeling to your eyes with those waterfalls and lush green forest around. The peak at Rajmachi point has two forts for trekkers, The Shri vardhan fort and Manoranjan fort are just great trekking locations for beginners to climb in monsoon. This small trekking spot is famous and known for its sub plateaux called Suvela Machee, Padmavati Machee and sanjeevni Machee, This trekking fort can be reached by Gunjavna Village located at Nalsalput Junction. A great Monsoon adventure and tourist attraction this fort has accommodation facilities at famous padmavati temple which has huge water tanks that last complete year. Located near Lohgad, Visapur fort at Malavli near Lonavala is just 2.5 kms. Specialty for trekkers being its arch and caves and few old houses near. The trek walls at visapur takes about 2 and half hours. Always follow the basic trekking rules and directions on trekking tracks. Always be with your seniors who already had experience at such trekking places in Monsoon seasons around Mumbai. A plastic bag that can handle all your electronic gadgets like Mobiles, Cameras and other music instruments will be a ideal choice to keep before you start you monsoon adventure. Basic things like water, mugs, dry snacks should be carried as not all locations has food and accommodation facilities available. The first aid box is a must for any day or over night trek to this forts and mountains. Wear trekking shoes, or any comfortable tough sport shoes, Loose t-shirts and shorts which are ideal and recommended for any trekkers. It is also a safe option when it comes to adventure that can have insects and other reptiles walking along with you. Torch with extra charges batteries, Swiss knife, 50 to 100 feet long rope, Sewing kit, Toilet papers and extra newspapers is a must before you being your monsoon trek. Better avoid such treks in monsoon if you are not fit. If you have asthmatic or heart related problems, inform and council with your trekking leaders first. ADDITIONS : You can also goto Malshej Ghat near Mumbai for trekking and Abseiling adventures.